Business faces huge competition these days due to the advancement in technology. Organizations should be able to utilize information and create new knowledge to lead their business. Innovations in technology and interconnectivity of things are generating an enormous amount of data every day. Data integration helps to move the data from the source to the target. now we will discuss the concept of Modern Data Integration. Many organizations are using data integration talent to create value for their business. Data integration becomes more important when two companies are merging or when consolidating applications within a company to provide a view of the company’s data assets. The data integration applications do not work simply. They need codes to do the process. A lot of problems will arise related to its maintenance, documentation, and transference. In this process should involve all the departments in a company. In this process, you should ask yourself a few questions. What are the objectives of data integration? What are the sources from which the data can be derived? Is the available data enough to meet the requirements? Does the data integration go with the business rules? What is the support, model? What are the SLA requirements? What are the ways to extract the data from the sources? Is there a need for other non-functional requirements such as data processing need, security policy, backup policy, and others? Who will be the owner of the system and what will be the total amount of expenses? The answers to all the above questions should be documented and signed by all the members who are involved in the data integration project. Based on the analysis of the requirements and the SRS document, a detailed study is performed to select the appropriate tools to implement the data integration system. There are a lot of tools available in the market and selecting the best tool for your business is the biggest challenge. Companies who are new to data integration need to implement a new tool and companies who have already used or using such projects can just extend their existing system. Selecting the best tool that suits your business needs will be more effective and will help for future growth and expansion of the business. Testing is an important phase of data. A proper testing is needed to make sure that the unified data are complete and correct. The IT department and the entire business need to take part in the testing process. The different testing methods that can be used are Performance Stress test (PST), Technical Acceptance Testing (TAT) and User Acceptance Testing (UAT ) PST, TAT (Technical Acceptance Testing), UAT (User Acceptance Testing). There are several data integration techniques performed by the companies. Application Based Integration – This is used only where there is a limited number of applications. Enterprise Data Replication (EDR) – these products gives information about the data sets and when they have to be changed or modified. There is a lot of data and you need to blend the data every time before you transfer it. Appoint an agent in the host platform so that all the process is done locally before the data is transferred. By moving the processing system to where the data lives will reduce the movement of the data through the network which in turn will save time. If you are making investments in modern data platforms every platform will have a default set of functions and workloads. Modern data integration uses those default functions within the platform. Through this way, the performance of the data blending can be improved and the data movement can be reduced. Modern data platforms should be centrally engaged with all the business rules and data logic. It is possible only when the local processing system is kept separate from the central design studio. Managing the business rules and data logic can help to maximize there usability and provides transparency. If the management is handled centrally all the business rules and data logic templates can be kept under a single roof. If there is any change to be made to the data or platforms then such changes can be made quickly and efficiently. Today’s software applications are implemented as cloud-based services that will expose the SOAP/REST API’s for data and metadata management based on business goals. In today’s scenario, SaaS applications restrict access to the database behind their services. Modern data integration offers an easy and quick way to use REST and SOAP. They should provide an easy way to use these API into business. IT departments in an organization are moving apart from data warehouses and moving towards data lakes that are the central location of data based on the Hadoop cluster. Spark is the most recent technology used to transform data of large amounts in this environment. Cloud data warehousing technologies act as a substitute for expensive data warehouse applications. Data integration tools have to be easy to access and understand and it should possess large-scale distributed frameworks such as Spark. The data velocity is relatively high these days. Any change in the data velocity or data size should not expect you to change the data integration tools as a whole. Previous data integration tools were designed to handle either a large volume of data or less volume of data. Modern data integration should have the ability to handle the data at whatever the size it is. The data integration tools should be able to process the huge amount of data easily and deliver proper responses to improve business actions such as adding new products or adding new customers. Data integration tools should respond to a business event quickly as it happens. If the stock of an inventory has to be increased because of the demand then the data integration should process this information quickly. The previous generation of data integrating tools sends and receives hierarchical documents as such instead of transforming it into row sets or into compressed payloads. 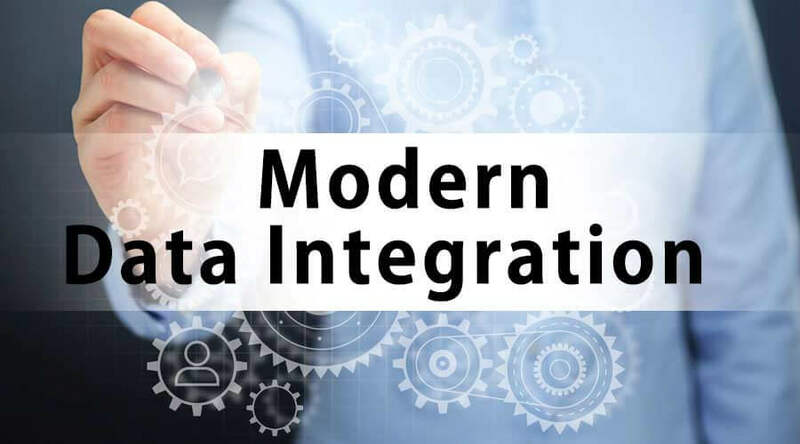 Modern data integration was established to make the internal engines work efficiently as the biggest impediment against the old generation of data integration tools. These days software packages are cloud-based. Still some organizations invest a lot in on-premise applications that take a lot of time to migrate into the cloud-based applications of the enterprise. Modern data integration technology is able to handle the on-premise as well as cloud-based applications easily and effectively. Modern data integration should go well with the other functions of the organization like monitoring, security, and others. For instance, if a company wants to monitor the success of integration flow through its own tool then the modern data integration should allow the company to add more users automatically with ease. Data Integration mainly depends on connectivity. Data integration is about connecting different systems with an API set. The integration tool should also need a proper framework to process the data without wasting time and effort. There are also a large number of pre-built connectors available which will help in the easy and quick implementation. It also helps to respond to the queries quickly under new scenarios. The demands of data integration differ every day based on business events. In a single day there may be a lot of integrations taking place under a scenario and the next day there will be the normal amount of integrations taking place. Modern data integration should have the capacity to handle the worst as well the good situation. The integration tool should be able to adapt itself to different situations. Today’s world is cloud-based and data-driven. Modern data integration technology has to be rendered as a service that can be easily accessible by anyone who needs to use it. Modern data integration should be elastic to meet the demands of the business. The traditional data integration technology is more complex and takes a long time to implement. The updates are also expensive. The modern data integration technology is directed towards a new class of users who are called “citizen integrators”. Modern data integration offers a simple design and easy management system. It can meet all the requirements of the users. New trends in the industry are making data integration more important than ever. Businesses today are facing problems to deal with a large amount of data. To improve the business results they need to convert their data into an asset. More powerful and flexible data integration technologies have to be used to transform the data into a usable form. All the new requirements of data integration have resulted in the development of a new field of integration called integration platform as a service.